Alberta is a western province of Canada. With an estimated population of 4,196,457 as of July 1, 2015, it is Canada's fourth-most populous province and the most populous of Canada's three prairie provinces. Its area is about 660,000 square kilometres . 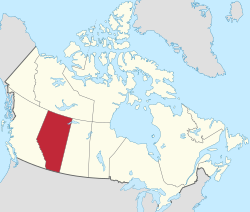 Alberta and its neighbour Saskatchewan were districts of the Northwest Territories until they were established as provinces on September 1, 1905. The premier has been Rachel Notley since May 2015. Alberta (/ælˈbɜːrtə/) is a western province of Canada. With an estimated population of 4,196,457 as of July 1, 2015, it is Canada's fourth-most populous province and the most populous of Canada's three prairie provinces. Its area is about 660,000 square kilometres (250,000 sq mi). Alberta and its neighbour Saskatchewan were districts of the Northwest Territories until they were established as provinces on September 1, 1905. The premier has been Rachel Notley since May 2015. Alberta is bounded by the provinces of British Columbia to the west and Saskatchewan to the east, the Northwest Territories to the north, and the U.S. state of Montana to the south. Alberta is one of three Canadian provinces and territories to border only a single U.S. state and one of only two landlocked provinces. It has a predominantly humid continental climate, with stark contrasts over a year but seasonal temperature average swings are smaller than to areas further east, due to winters being warmed by occasional chinook winds bringing sudden warming.